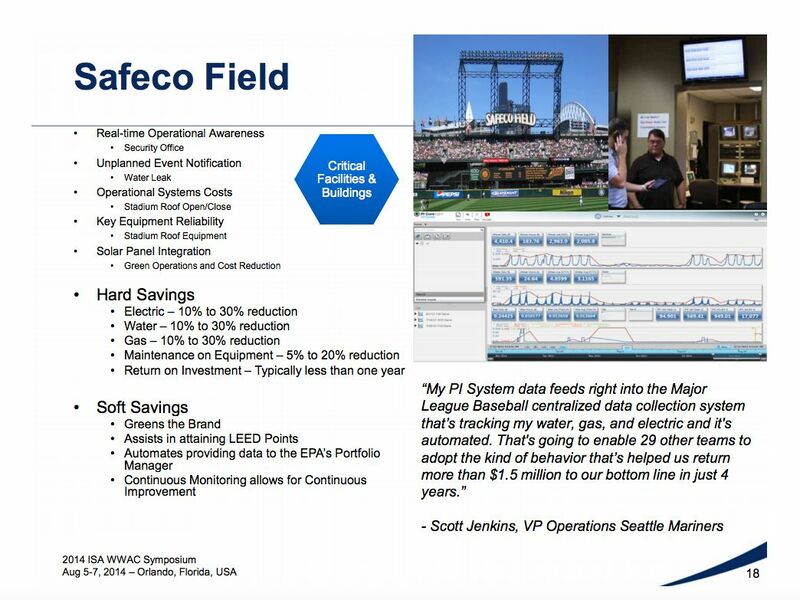 Safeco Stadium uses OSIsoft PI analytics for insight into facility operations. Many have heard about how Microsoft uses data to save energy and improve facilities operations because Darrell Smith has been such an outstanding spokesperson for the effort. OSIsoft’s PI Analytics framework is a part of this ongoing project at Microsoft’s Puget Sound campus as well as at Carnegie Melon University. But, did you know that OSIsoft Predictive Analytics are also being integrated into facilities operations at multiple Major League Baseball stadiums? Scott Jenkins, current Chairman of the Green Sports Alliance as well as Stadium General Manager for the Atlanta Falcons, oversaw the first implementation at Seattle’s Safeco Stadium, home of the Mariners while he was VP of Operations there. He explains the benefits in this video. – Why was that electric bill so high?